First of all, let me just say THANK YOU to everyone who helped me spread the word about Grave Witch. This is the first contest I've run in the three (four?) years I've been blogging in which entering entailed more than just leaving a comment. I have to admit that I was a little nervous. I mean, what if no one cared and no one entered? But you guys are the best readers a girl could ask for. The Get the Word Out contest had over two dozen unique entries, so again, THANK YOU!! Jessica - Who helped spread the word here. Jennzah - who got the word out here. Kate - who posted everywhere for a total of 5 entries (wow!) Her facebook post was the one that was drawn out of the hat. Click here for more details on how to enter. Winners will be announced tomorrow (Monday 8/16) so check back soon! Don't forget that the Get the word out contest (with your chance to win a cool swag pack including the Ace/Roc sampler) is running until Sunday August 15th. Details can be found HERE. The mail guys around here probably think I'm crazy with all the packages suddenly pouring in. It's typically not like this. I'm preparing for a release and for the biggest Convention on the East coast, so, well, I've been busy. Today's gain? A big box from Vista Prints. I might have to add the FedEx guy to my Christmas card list if he keeps making my day the way he has over the last week. If you heard sequels of delight yesterday afternoon and caught sight of some crazy girl dancing around, that was probably me. 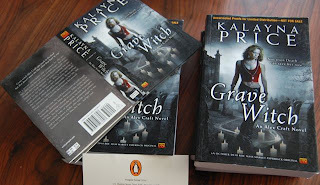 A package arrived yesterday containing several ARCs of Grave Witch, and I held a bound copy of my book in my hands for the first time. Contest: Get the word out! What do you think? I hope you like it. Yes, that widget is counting down to October 5th and Grave Witch's imminent release. And yes, I'm getting excited. Late yesterday afternoon the FedEx guy dropped off a huge box of Roc Samplers on my doorstep. These samplers include the first chapter from seven upcoming and recently released Ace/Roc novels, one of which, being Grave Witch! If you direct your attention to the upper left hand side of the sample book, you can see Alex from the front cover. This is the first time I've seen even part of the cover in print, (aside from my own promo materials, of course) and I was downright giddy when I opened the box. These samplers are just gorgeous in their layout, presentation, and binding. My editor told me months ago that she wanted to include Grave Witch in the promo material they would be giving out at ComicCon (which is what these samplers are from--apparently thousands were given away a couple weekends ago) but I had no idea what form the final product would take. I couldn't be more excited that she sent me some of the remainders and that I will get a chance to pass them on to you! Several of my writer friends recently returned from the RWA National conference. I've never personally been to the conference, but from what people tell me the con is an amazing place not only to learn about craft, but to check the pulse of the writing business. Most major publishers and dozens of top notch agents attend every year. Trends in publishing inevitably come up at the conference and the RWA loops are always buzzing with what was said once the conference ends. What's hot? What's selling? What's out and overdone? Coming to a blog near you . . . I can't believe Grave Witch will hit shelves in just a day over two months from now. Two months seems both very distant and way sooner than should be possible. I'm excited and terrified all at once--which means it's a good time to start planning a party. Yes, a party. A party spanning the majority of September and October. In preparation for Grave Witch's release I plan on hosting events and giveaways, and if I can arrange it, a whole slew of special guests. The idea to host guests didn't hit me until yesterday, so I'm scrambling to get the list together, but I've already heard from one of my favorite authors and contacted several others, so things are looking good, party-wise. As soon as I have nailed down dates, I'll release more concrete information. For many years, I've covered most bags I own in 'flare'. I can't remember exactly when I started doing it, but it's become quite a habit. I'm hard on bags and harder still on buttons (I lose the backs of pins and accidentally rip the faces off buttons on a regular basis just by walking around), but as a whole, there are always new buttons to replace old ones. I love buttons and pins that let me display a little hint into my interests, affiliations, and attitude. Bands I love, movies I enjoyed, art I like, funny sayings . . . whatever, I enjoy showing it off in button form. When in conversation, I've often stopped and said "that should be a button!" I've done this so often around my writing group that we now have shared file called 'sayings for buttons'. Unfortunately, none of us had access to a button maker, so these sayings have just sat in a google docs list for the last few years. As I was searching for a friend's house this afternoon, I discovered there is a road about two miles from my new house called Lonely Street. I didn't take this road, but I glanced down it as I drove by. It was a small, one way street with overgrown foliage pushing in on either side. The pavement extended only a couple yards past the main road; then it turned into a dirt road with two deep trenches where tires had cut a path and weeds covering the mound in the center. It did, in fact, look very lonely. Okay, that's it for me. I hope everyone is having a great day!